Diary of Andrew Bloxam, Naturalist of The "Blonde" On Her Trip from England to the Hawaiian Islands 1824-25. 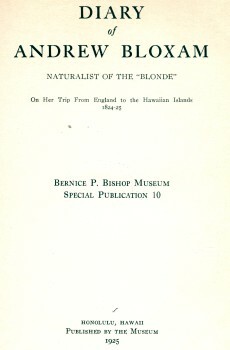 Bernice P. Bishop Museum Special Publication Volume 10. Bernice P. Bishop Museum, Honolulu, 1925. The Blonde, under the command of Captain George Anson Byron, was sent to Hawaii in 1825 to return the bodies of King Kamehameha II (Liholiho) and Queen Kamamalu, both of whom had died of measles, aged 28 and 22 respectively, while visiting England. Amoung the Hawaiian party were Boki, and his wife Kuini Liliha (1802—1839), who was noted for her surfing skills. Boki (before 1785–after December 1829) was a High Chief in the ancient Hawaiian tradition and served the Kingdom of Hawaii as royal governor of the island of Oahu. The ship's chaplin was Richard Rowland Bloxam, who was a contributor to the the first published account of the voyage in 1826. 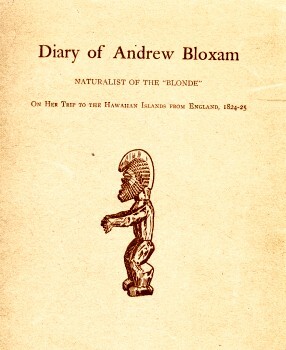 His brother, Andrew Bloxam, was one of the expedition's naturalists and his diary was published in 1925. Extracts from the diary of Scottish botanist, James Mcrae, was published three years earlier in 1922. Robert Dampier joined the Blonde in Rio de Janeiro, serving as artist and draftsman, his diary published in 1971. "The ship left Spithead, England on 28 September 1824. Following a call at Madeira, they reached Rio de Janeiro, Brazil on 27 November 1824. After spending time both in Rio de Janeiro and St Catherine's, they left Brazil on 1 January 1825, bound for Valparaíso, Chile, which they reached on 4 February 1825. They sailed north up the coast to reach Callao, Peru, on 16 March 1825, before sailing west to the Galapagos Islands, where they remained from 25 March to 3 April 1825. The Blonde arrived in the Hawaiian Islands (then known as the Sandwich Islands) on 4 May 1825. The party remained in the Hawaiian Islands from 4 May to 18 July 1825. They left planning to go to Tahiti, but actually landed first at Malden Island on 30 July 1825 and then at Mauke in the Cook Islands on 8 August 1825, before returning to Valparaíso, which they reached on 6 September 1825. The voyage ended back in Spithead, England on 15 March 1826, after an absence of 532 days. [McCrae, 1922]"
Voyage of H. M. S. Blonde to the Sandwich islands, in the years 1824-1825. John Murray, Albemable Street, London. 1826. "This work is frequently catalogued under some combination of Bloxam, Byron and Callcott. Only Byron's name appears on the title page, although he does not appear to have contributed to the work in any way. R.R. Bloxam is credited in the introduction. Callcott's surname at the time was Graham." The brief surfboard description is a footnote to the surfriding activities of Liliah, the wife of Boki, a member of the royal household returning to Hawaii, page 97. "May 3rd 1825 ... Her fame, as being the best swimmer, and one, who would go thro' a heavy surf, before any of her less daring Companions, is universally acknowledged." - Dampier: Voyage of the Blonde (1971) page 30. Note that in both cases, her reputation preceeds the arrival of the Blonde in Hawaiian waters. Dampier and Bloxam both refer to Liliah as Madam Boki. Byron's comments on several Hawaiian water sports - waterfall sliding, cliff jumping and jurfriding (page 166). There is a brief description of Hawaiian woodworking skills (pages 137-138) and of Polynesian (Cook Island) canoes and their skill in negotiating difficult surf conditions follows (pages 209-209). Bryon met the noted missionaries of the period, Ellis and Bingham on his visit to Hawaii (page 148), and the Blonde transported Stewart between two islands. 1825 Lord Byron : Liliah and Floatboards. With Lord Byron at the Sandwich Islands in 1825 : being extracts from the MS diary of James Macrae, Scottish botanist. Macrae has only one brief reference to the aquatic sports of the Hawaiians. Page 20. Bathing The Chief Amusement Bathing is their chief amusement and alone induces many of the higher ranks of them to leave their houses, where they spend most of their time sitting or lying down asleep on mats. But the whole tribe is so fond of bathing that the sea shore is seldom seen without numbers of both sexes swimming with perfect ease, as if some species of aquatic creatures. - Hawaiian canoes, pages 21. - surfboards stored in royal household, page 26. - Blonde officers adopt native bathing practises, page 34. - land sled, page 42. - surfboard riding at Waikiki, page 46. - purchase of Hawaiian antiquities, page 47. - canoes at Hilo, page 52. - natives dive for lost guns, page 54. - waterfall-sliding at Hilo, page 54. - canoe construction in the Cook Islands, page 84. University Press of Hawaii for Friends of the Library of Hawaii, 1971. - the aquatic skills of Madam Boki, page 30. - Hawaiian canoes, pages 30 to 31. - the demand for Hawaiian antiquities, and the production of counterfeits, page 44. - the replacement of stone tools with the iron English adze, page 47. - surfboard riding, page 51. - canoe surfing, experienced by Dampier, page 51. - Blonde officers adopt native bathing practises, page 57. - waterfall-sliding and cliff jumping at Hilo, page 57. - canoe construction in the Cook Islands, pages 74 to 76. 1825 Robert Dampier : Sandwich Islands. "Admiral George Anson Byron, 7th Baron Byron (8 March 1789 – 1 March 1868) was a British naval officer, and the seventh Baron Byron, in 1824 succeeding his cousin the poet George Gordon Byron in that peerage. As a career naval officer, he was notable for being his predecessor's opposite in temperament and lifestyle. He was the only son of George Anson Byron and Charlotte Henrietta Dallas, and grandson of the admiral and explorer The Hon. John Byron, who circumnavigated the world with George Anson in 1740-44." Ship's chaplin and elder brother of Andrew Bloxam. "... an English clergyman and naturalist; in his later life he had a particular interest in botany. He was the naturalist on board HMS Blonde (his brother Rowland Bloxam was the chaplain) during its voyage around South America and the Pacific in 1824–26, where he collected mainly birds. Later as a Church of England minister he lived in Warwickshire and Leicestershire and made significant contributions to the study of the natural history of the area. His special interest was in fungi and the genera Rubus and Rosa. His botanical author abbreviation is 'A.Bloxam'. On returning to England, Dampier, like fellow mariner Andrew Bloxam, became a clergyman. He was a High Chief in the ancient Hawaiian tradition and served the Kingdom of Hawaii as royal governor of the island of Oahu. Liliha: the wife of Boki, companion to Kamehamaru on his visit to England in 1820? She was occassionally refered to as "Madame Boki". Extracts from John Byron in Hawkesworth: Voyages in the Southern Hemisphere, (1773), Volume 1? Extract from The Mid-Pacific Magazine, Volume 2, Number 2, August,1911, frontpiece. Boki (sometimes Poki, born Kam? ?ule?ule} (before 1785–after December 1829) was a High Chief in the ancient Hawaiian tradition and served the Kingdom of Hawaii as royal governor of the island of Oahu. Boki also encouraged the Hawaiians to gather sandalwood for trade, and ran a mercantile and shipping business. Boki was appointed Royal Governor of Oahu and chief of the Wai?anae District by Kamehameha I, and continued in his post under Kamehameha I's son Kamehameha II. 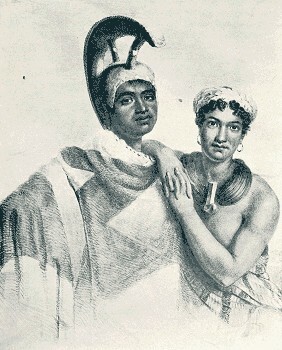 Boki and his wife Kuini Liliha (1802—1839) were leading members of the delegation to England when King Kamehameha II and Queen Kamamalu contracted measles and died. Returning with Admiral Lord Byron to the Hawaiian Islands aboard the British frigate, HMS Blonde, bearing the bodies of the King and Queen, the ship stopped at Brazil and obtained several coffee trees that in turn were the Arabica strain originating from the plateaus of Ethiopia. Upon his return, he gave the trees to ex-West Indies settler and agriculturalist, John Wilkinson, to plant on the Chief's land in Oahu's M?noa Valley, but was never able to cultivate the trees for commercial production. He later tried to profit from the fame of the voyage, and moved a wood frame house inland and opened a store and inn called the Blonde Hotel. He became unpopular with local missionaries because he sold liquor in his stores. He stocked his bar with cheap but bad wine, saying it was good enough for visiting sailors. Like his other business ventures, it was not profitable to himself, but perhaps was to his employees. One of them claimed the building in the 1830s, calling it the "Boki House". oki, himself, was not completely averse to change and had immersed himself in the sandalwood trading business after the restrictions on the tree placed by Kamehameha I was no longer in force. He grew rich, like many other chiefs, but the chiefs' lack of understanding of financial concepts caused him to become deeply indebted by 1829. When word reached him that New Hebrides, a faraway group of South Pacific islands, was heavily forested in sandalwood, he pulled together a fleet of two ships and set sail. It is known that he reached Rotuma in 1827 and also called at Erromanga however when he failed to return to Hawaii it was assumed that he had perished at sea. Despite the Hawaiian belief that he died during his sandalwood expedition, there is evidence that Boki was alive and well in Samoa in the year 1830. According to Marques' 1893 report, Boki's ship was wrecked in 1830 near Iva on the Samoan island of Savai?i where he rallied under the banner of the ambitious Samoan chief, Malietoa Vaiinupo. The Hawaiian embassy delegation sent to Samoa by King Kalakaua in 1886 learned that the two Prussian cannons from Boki's ships were indeed still to be found in Iva village along with "many of his descendants". At seven this morning the island of Owhyhee (Hawaii) broke indistinctly on our sight. About eight a fine breeze sprang up which in an hour brought us to within three or four miles of the most easterly part of the island; this is a long, low point and near it but more to the northward the ground is thrown up and disturbed apparently by volcanic agency, as we could plainly distinguish several large craters, some time however must have elapsed since they were in action as several coconut and other trees and shrubs were observed growing on their sides and edges. Mauna Kaah was completely obscured from our sight by the same cause. (Footnote) 3. Place names are spelled as in the original manuscript; modem spellings are gIven on page 94. Plate - Facing Page 21. From a stone engraving of a painting from life, by John Hayter, London, 1824. "Liliah had been accounted one of the best swimmers in the island, and was particularly dexterous in launching her float-board* through the heaviest surf,"
- Byron: Voyage of the Blonde (1826) page 97. Liliaha is identified as Madame Boki in Bloxam's diary and Dampier's account. All the canoes we saw were single, extremely neat and well made, several carrying six or eight men. They are very narrow, scarcely affording room to crush into, some in the broadest part not exceeding 12 inches. They are about 2 feet deep, and all possessed an outrigger and mat sail. The outrigger consists of a strong piece of very light wood, in a curved form and placed at a distance of about 6 feet from the canoe and nearly of the same length. It is united to the canoe near the two ends, by two other stout pieces of wood bending over in a curved form. On these two pieces the sail when not used is placed. They row very fast with their broad paddles and easily keep up with the ship when going moderately. They are often upset in them, but being excellent swimmers, they soon right them and bale out the water. Those we saw are about 16 to 18 feet long. The men in the canoes are wholly naked with the exception of their mayo, or girdle wound round their loins, which is a strip about a foot broad and nine feet long. Several had their hair dyed in a fanciful manner a white color by means, it is said, of lime. One of the canoes brought a pig and a quantity of poe (native food made from the taro root mashed) for the Sandwichers. In the evening the two ship's boats returned, and from their statement it appears to be a most eligible and safe harbour where plenty of water can be procured without any trouble. Having dismissed the canoes and hoisted up the boats we made sail about 6 p.m. for Mowee, 75 miles distant, where we touch on our way to Woahoo, the ultimate destination of the bodies. The country about Aheedoo appears much like a park in England, everything is green and verdant with numerous trees scattered about, and here and there a romantic waterfall, upon the whole we are delighted with its appearance. Laaina (Laihaina) is situated on the western side of Mowee opposite Ranai, and is protected from most winds by the situation of the surrounding islands, the town extends along the shore in a straggling manner for about a mile and a half, the huts being intermingled with coconut, breadfruit, and other trees. Immediately behind the town are numerous patches of cultivated ground. I counted about seven hundred huts and I should judge there were nearly a thousand; the populace seemed to be great. ... plaster on the outside, which compared with the huts made it look like a palace. The missionary church is a long; low, straw shed with a half dozen open windows here and there, placed without any regularity; dogs, goats, fowl and pigs are numerous. We could see quantities of people on shore looking at us and collecting together in circles. A reef prevented our boats getting on shore so early as we wished, it being low water at the time. We anchored in nine and three-quarters fathoms and the water was so clear that we could with the greatest distinctness see the bottom, being near sixty feet deep, it appeared to be hard coral and sandy ground. Soon after breakfast I went on shore taking with me a few articles for the purpose of bartering. Lord Byron had gone a short time before, and as I walked through the village I joined him at the late king's house where we found a number of people sitting, Boki, Madame Boki, her father, a sister of Rio Rio, the late king, and several other chiefs. The house was like a large thatched barn, but very neatly built and put together, the door which was large was the only opening and consequently admitted the only light. The interior consisted of one large room furnished with several chairs, a sofa, and quantities of mats, some covering the floor, others placed to the number of twenty or thirty, one upon the other (the coarser kind at the bottom and the finest mat at the top). These formed their beds or couches when they sat or lay down. ... of sandalwood logs lay at the extremity of the room, and the walls were hung with surf boards and canoes placed against them. The end of the room on the right hand was separated from the other part by a low fence of canes. This was probably their kitchen. We were invited to enter and sit down, and as we conversed, every now and then a tobacco pipe was passed round for each to take a whiff and pass it to, his neighbor. A native sat and fanned Madame Boki's father, who appeared to be the principal person there, at the same time holding his. spitting box, which was neatly carved out of some hard and handsome wood. ...I slept in a house close to the landing place, belonging to Queen Kaahumanu, built in the European fashion but without any chimney. ... yards of the sea we enjoyed bathing very much. It had four very good rooms, two on the ground floor and two above, the latter sleeping rooms. A native hut served as our kitchen. Lord Byron and Dampier slept in one room, myself, brother, and Davis in the other. I walked along shore towards the bay of Whyteete to see if I could procure any shells, but I found none worth picking up. The whole distance to the village of Whyteete is taken up with innumerable artificial fishponds extending a mile inland from the shore, in these the fish taken by nets in the sea are put, and though most of the ponds are fresh water, yet the fish seem to thrive and fatten. ... to the chiefs, and are caught as wanted. The ponds are several hundred in number and are the resort of wild ducks and other water fowl. I found it very difficult to get out of the labyrinth of paths which lead among them. Whyteete is about four miles east of Honoruru. It is pleasantly situated and built along the shore among numerous groves of coconut and other trees, and in this respect far better than Honoruru, as scarcely any trees are to be found there. Diamond hill, the southeast point of the island, is about two miles beyond. It is lofty, insulated, and appears to have been the crater of an extinct volcano. It took its name from some crystals having been found there, which were at first mistaken for diamonds. ...Near one of its sides are the remaining walls of an old morai or temple; the sea washes its base and hence it forms a good landmark for ships. As we approached the sea our further progress was arrested by a number of taro ponds, and as we could not approach the shore without going far round, we gave it up and returned to the hut where we intended to sleep. There was only one'door to it about two feet high and no window, or other aperture. In the middle of the hut was a hole about a foot deep which served as a fireplace, the smoke escaping through the low door and roof as it could. Along the roof hung a machine something in the form of a sledge, we found that the natives use it for sliding down the hills, a very common but somewhat dangerous amusement. It consists of two pieces of wood about twelve feet long, turned up at the end like a pair of skates, they are about two inches in depth and three-quarters of an inch in thickness; cross pieces join them toge!her at about a distance of four or five inches and upon these a kind of matting is fixed for the sup- port of the body, rising from the sledge part about six inches and of the same breadth. The method of using it is this: they take it, and hold it perpendicularly before them with the turned up part uppermost, they then run and coming to the brow of the hill, suddenly throw themselves upon it head downward and are borne along to the bottom with the greatest rapidity. But it requires much skill in the management and accidents frequently occur from its turning over and the possessor of it told me that the last time he used it he had much hurt himself and nearly broken his neck. Remained on board all day. After divine service Kaukini, Governor of Owhyhee, came to pay Lord Byron a visit. He is one of the largest men in the island, weighing twenty-eight stone. In the evening the men bathed, having a skidding sail placed over the side for those who could not swim, in the midst of it we were suddenly alarmed by hearing that the whaleboat had been upset in the surf going into the harbor. ... A great swell had rendered the surf higher than usual today; but it frequently is dangerous, the mouth of the harbor being so narrow. Rode on horseback by Whyteete to Diamond Hill, at the former place I observed the natives diverting themselves in the heavy surf with their swimming boards, or "epappa's" as they are called. I procured a quantity of small cowry shells of a common sort and about an inch in length, for a few needles. Employed preserving birds; the ants, I find, make sad ravages with them. I procured today for a dollar two very old and curious carved idols, or native gods, one of which I presented to Lord Byron, the other is now in the Oxford Museum. The climate is now very delightful, particularly in the morning and evening, the midday being rather too warm. We usually have a few refreshing showers early in the morning which lay the dust and render it pleasant the rest of the day, We enjoy sea bathing very much, it generally being the first thing when we turn out of bed in the morning, and before we retire at night, I am usually occupied in the day time by excursions into the interior; the surgeon is engaged in attending the chiefs and their wives, who seem to be very fond of taking his pills; the artist is sketching and taking portraits of the young King and Queen; and Lord Byron and my brother, in visiting Karaimoku and the other principal chiefs, gaining information of them respecting the islands and talking political subjects, etc. Went on shore early this morning and took a walk among the environs of Waikea, as this village in the district of Aheedoo is called. The harbour is a large deep bay open to the north, but protected from heavy weather by a coral reef running out from a small island named Coconut Island, nearly across the bay, leaving a deep passage of half a mile broad on the left hand shore coming in. The latitude of Lord Byron's house was 19 degrees 43 minutes 90 seconds north. The taro is cultivated here in great quantities, not in ponds as at Woahoo but on dry land, the Pandanus or screw pine, Malacca apple, plaintains and bananas are common, as well as the other forementioned fruits. A small one may be procured for six or seven dollars and a good sized one for fifteen or sixteen dollars. The midshipmen procured' one of a larger size, in which they used to amuse themselves, it was rather unsafe, as I experienced myself in having been upset in it with three others. "I measured one of their double canoes and found it to be 52 feet long and 3 feet deep. "- Editor. I was going on shore in a canoe with Lieut. Gambier, Mr. Gooch, and Smyth, midshipman. The two former had double barrel and I my single barrel gun. We had not gone more than 50 yards from the ship, when owing to our leaning too much on one side it upset and all our guns went to the bottom. Smyth was the only one who could not swim so I immediately jumped on the bottom of the canoe and pulled him on it. The others swam to a boat moored a little way off and waited until assistance came from the ship. We lost our guns in six fathoms water, but thinking they might be recovered by diving, I went to Queen Kaahumanu and she immediately sent for six of the most expert divers in the village, with whom I proceeded in a double canoe to point out the spot, having promised them certain rewards for procuring the guns. They all stood on the edge of the canoes, and made a dive altogether some staying under a space of two minutes. Nothing was brought up the first time; the third time Mr. Gooch's double barrel, and the fifth time my own were found, but they did not succeed in procuring the other which was the most valuable. They dived in all seven times, taking proper rest between each. They were all well rewarded, but the person who brought up both guns received in addition a knife, file, fishhooks, etc. In the evening I went with Lord Byron in his double canoe which the Queen had assigned to him, as his gig was being repaired. We proceeded to the watering place, where are two picturesque falls, one of more than 20 feet, with a rock in the middle separating the water into two channels. We were amused here by a number of children from eight to twelve years of age, suffering themselves to be carried down this fall, feet foremost and swimming out some distance below. Almost all the native children from six years upward can swim, water seems, in fact, to be their native element as they are constantly dabbling in it. A large party consisting of about two hundred natives came in from the district of Puna bringing tribute and presents to Kaahumanu consisting of tapas, mats, and provisions. Their approach was extremely pretty, as they walked in a line one by one, each carrying a bundle, and winding round the side of the river. Numbers came in the two succeeding days also, bringing presents. The magic lantern was shown to a big audience of natives who were greatly surprised and delighted at the changeable figures. We also set off some rockets, and a paper air balloon, but the latter caught fire almost immediately and falling on Lord Byron's grass house was near setting it in flames. These days were very fine, showers of rain generally fell of a night, which cleared up as morning dawned, and at sunrise Mouna Kaah and Roa were almost always visible, the former presenting a very beautiful sight, as we could see the rays of the sun shining upon its summit several minutes before they reached us. ... We had most excellent bathing here, as Lord Byron's house was situated close to a fresh water river at its exit into the sea, so that we could enjoy either fresh water or sea bathing as we pleased. Kaahumanu had assigned a large new grass ,house to his Lordship, the bottom was covered with mats, and a small portion taken off at one end for his Lordship's bed. At the three other corners Mr. Dampier, Davis and I slept in our cots slung up, and my brother next to Lord Byron. We had tables, chairs, and cooking apparatus, were well supplied by the Queen with fish, fowls, pork, kid, and vegetables, and though all living together in one large room, enjoyed ourselves very much. I used to spend my time shooting, making excursions into the woods, and paddling in the canoes. We had heard much of a volcano of extraordinary size, and were most desirous of seeing it, a large party therefore was formed for making the journey. This morning we were about four miles from the western or lee side of the island. We could distinguish with our telescopes several canoes with very high peaked sterns. We therefore lay to and soon after a small canoe with one man in it (having on some tapa and a round straw hat); came alongside with much confidence, and ascended by the ropes to the quarter deck. He had evidently seen ships and Europeans before from his dress and manner of behavior. We addressed him in the Sandwich Island language and made out the name of the island to be Mauti [Mauiki or Mauke, one of the Cook Islands]. I was permitted to go in the cutter and took my gun with me in case of meeting with any curious birds. After a long row we approached the landing place, but found it impossible from the heavy surf for any of our own boats to attempt landing. We therefore got into one of the native double canoes, and a careful opportunity of the sea being watched we were carried on a coral rock about a foot under water and thence conveyed on the shoulders of the natives about forty or fifty yards to dry land. ... of the island for a distance of thirty or forty yards from the shore and a heavy surf is constantly breaking upon it, even on the lee side of the island where we were. There were about twenty canoes altogether, and about forty natives waited our arrival on the beach. And yet no signs of houses were seen, nothing but a road neatly paved with coral and forming an opening through the wood. We walked along through the wood a short distance, we suddenly came to an opening where we found several canoes, some in the building and others quite finished. Among the former were two immense ones nearly seventy feet in length, each formed out of two trees, very neatly joined and united in the middle vertically by means of a very strong native-made rope. The sterns of these were raised to a height of twelve or fourteen feet. We afterwards understood that the two, forming a double canoe, were intended for the purpose of communicating between the different islands, of which this group is composed. After we had passed beyond these, we proceeded through the woods, in which we found some trees of an immense magnitude- twenty-six or twenty-seven feet in circumference of the age I should suppose of several centuries. Geoff Cater (2011) : Andrew Bloxam : Sandwich Islands, 1825. Popular Mechanics Sep 1917, page 338.